In the early hours of Sunday morning, residential areas of Aleppo were bombarded with 120 mm mortar shells filled with chlorine gas, resulting in more than 100 people seeking medical treatment. Women and children were among those hospitalised and everyone complained of breathing difficulties. Aleppo is Syria’s largest city and one of the oldest in the world. It was divided in half during the civil conflict and the military operation to liberate the half occupied by militants was one of the most important carried out by government forces and became a major turning point in the war as a whole. At that time, the city was under the international spotlight for several months and the West regularly accused Damascus of allegedly committing numerous war crimes and crimes against humanity in order to gain time for the so-called moderate opposition. The areas under its control were next to those held by outright terrorists. By December 2016, it was all over. Reports on “Assad’s atrocities” turned out to be false, while some of the militants leaving Aleppo were transferred to Idlib province by agreement with the government. A large number of diverse groups have settled there over the many years of conflict, each of which is now getting on with life. If there had been reports of a chemical attack back then, when militants still held part of Aleppo, there would have been a huge outcry. The Assad regime would have been blamed immediately and it probably would have been a casus belli – yet another reason for the Western military coalition to attack Syrian forces. The chemical attack happened now, however, when Aleppo has been under government control for two years. The shells came from the direction of the Idlib “sanctuary”, where the front line is. 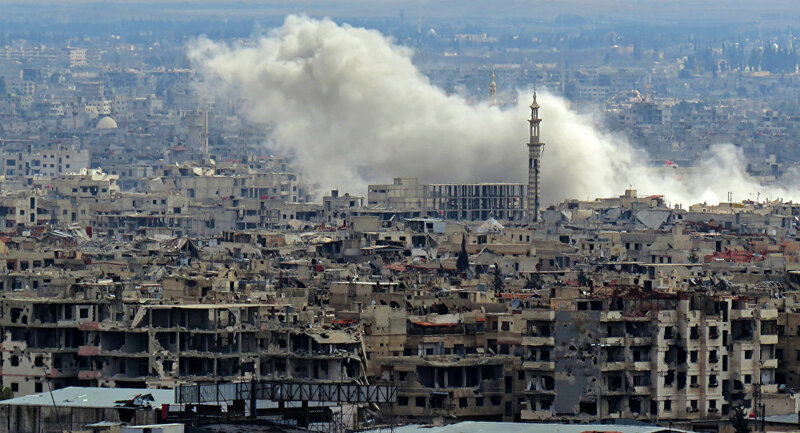 Nobody is going to believe that government forces are firing chemical weapons at their own rear units, so the Western community, including many human rights organisations, have met the attack on Aleppo with a deathly silence. The first Western leader to make a statement on the subject was French President Emmanuel Macron. “France condemns any use of chemical weapons,” stated Macron the day after the incident, including in the Syrian city of Aleppo. He added that he would be discussing the situation with his international partners. Incidentally, Paris was once one of the driving forces behind the West’s intervention in the Syrian civil war on the side of the armed opposition. Another of these driving forces during the battle for Aleppo was Turkish President Recep Tayyip Erdoğan, who accused Assad of carrying out “a genocide against his own people”. Ankara pursued its own interests during the conflict, but after the situation on the front lines was reversed in favour of Damascus, Turkey tempered its appetite and was forced to agree with Russia’s plan for a Syrian settlement. The so-called “de-escalation zone” in Idlib where the chlorine-filled shells came from is one of Turkey’s areas of responsibility. The most difficult questions regarding the attack should therefore be addressed to Ankara, in other words. Those behind the chemical attack have already been established. According to Aleppo police chief Essam al-Shali, the attack was carried out by terrorists from Jabhat al-Nusra, a local branch of al-Qaeda. This refers to the militant group Hay’at Tahrir al-Sham, one of the many rebrandings of al-Nusra. The Syrian Foreign Ministry is blaming the attack on the West. “This terrorist act comes as [a] result of facilitations provided by some countries to deliver chemicals to armed terrorist groups to use them against Syrian people and to accuse [the] Syrian Government,” stated the foreign ministry’s press office. Previously, the White Helmets were actively involved in events related to the use of chemical weapons in Syria. This organisation, which diligently disguises itself as a human rights organisation but actually acts in the interests of terrorists, has, for many years, been portrayed as one of the biggest heroes of the Syrian war. Its activities have even been the subject of an Oscar-winning documentary film. Interest in the White Helmets began to wane with the advance of Syrian forces, however, especially after they were caught red-handed falsifying a chemical attack. Whether all this means that the White Helmets, who are now cornered in Idlib, have moved from staging chemical attacks to organising real ones is an open question. It has been known for a while that Jabhat al-Nusra has its own chemical weapons and so does not need this kind of help from the White Helmets. 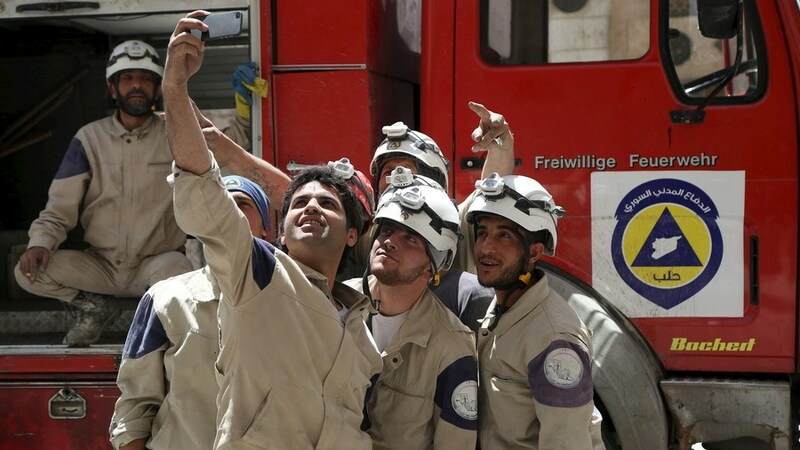 If their involvement in the attack on Aleppo is proved, however, and especially if the Syrian Foreign Ministry’s claim regarding the origin of the militants’ chemical arsenal turns out to be true, then the notion of the White Helmets will be completely turned on its head, as will the role of the American-led coalition in the Syrian conflict. The laws of the information war surrounding Syria are proving to be even more cynical than the laws of the actual war going on in Idlib. In an information war, whoever shouts the loudest wins, but this shout may be far removed from the actual state of affairs on the ground. The successes of the Syrian army have gone some way towards altering the perception of the Syrian conflict, but exposing the “massacre on the streets of Aleppo” as fake and uncovering the sham nature of the White Helmets’ activities has changed absolutely nothing. America’s refusal to finance the latter was nothing to do with the reputational risk associated with such fake activities, but was one of Donald Trump’s direct campaign promises to spend less on supporting the Syrian opposition and prevent members of the Syrian opposition from relocating to the US (immigration to the West was one of the White Helmets’ biggest motivations, many of whom are now in Britain). It would be far too optimistic to expect that the attack on Aleppo will make Washington and Brussels look at the Syrian war differently. The use of chemical weapons and the description of other war crimes by one side or another are nothing more than a backdrop to international negotiations, the focus of which has nothing to do with humanitarian beliefs, but rather each country’s own narrow interests that even outright thugs with chlorine-filled bombs may serve to advance. While some kind of benefit can be squeezed out of them, neither chlorine gas, nor genocide, nor mass executions will discredit them. But they can still be destroyed physically.